The 252 scheme will be running again for summer 2017. For those new to the scheme, it is a great way to challenge yourself and track your progress over the summer by practising shooting at different distances and receiving recognition of your achievements. This is a challenge for all Club members, both novices and experienced archers and all bow styles. The challenge is to score 252 points (or more) with 3 dozen arrows on a 122 cm target face at a set yard distance. 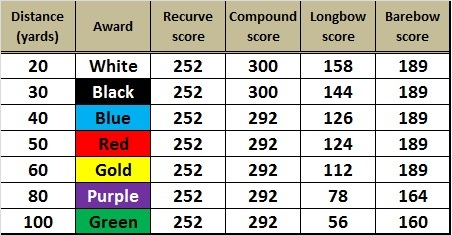 Each round is scored with imperial scoring (9, 7, 5, 3, 1) at all distances. To make it fair, scores have been adjusted for longbow, barebow and compound archers. Those who successfully complete each distance will receive a certificate of confirmation and can also purchase a coloured pin badge for the relevant distance to attach to their quiver. Rounds will be shot on any Wednesday Club night from 6 p.m and starting on 12th April 2017. This year, the scheme will be run by Lorna Stevens and John Pepper. Six sighters are permitted which will not count towards final scores. A total of 36 arrows are to be shot at a specified distance using a 122 cm target face and 5 zone imperial scoring. (Not including sighters). Once an archer has achieved the minimum required score a 252 certificate and badge maybe awarded on application. There is no restriction on the order of distances in which the awards are obtained. An archer can only claim one 252 score per day. It is the responsibility of the archer concerned to make a claim on a 252 score sheet (available in the clubhouse) witnessed by at least one other Club archer who will also sign the score sheet. Completed score sheets may also be left in the folder in the Clubhouse to be picked up by either Lorna or John.